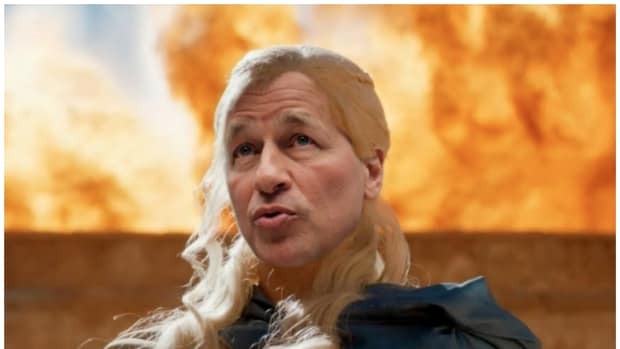 Be Jamie Dimon, do what you want. Be a board member, try to convince others to do what you want. Be a sell-side analyst, regulator, politician, former bank CEO, pundit, blogger, or person; write down what you want JPMorgan to do and why you want them to do it; and hope that they read it. Keep it to yourself and go about your business like a human. Be a troublemaking shareholder activist2 and submit a shareholder proposal asking the board to include in the proxy an advisory vote on whether JPMorgan should form a committee to look into doing the thing you want or something else like it or not like it. A federation of U.S. labor unions is looking to force JPMorgan Chase&apos;s board to consider breaking up the company after the disastrous "London Whale" affair, but the bank is trying to ensure that its shareholders do not get to vote on the union&apos;s proposal. The largest U.S. bank is seeking permission from the U.S. Securities and Exchange Commission to omit the proposal from the measures that shareholders vote on this spring, according to a letter sent to the agency on January 14. The actual proposal,2 from the AFL-CIO, asks stockholders to "urge that" the board "promptly appoint a committee ... to explore extraordinary transactions that could enhance stockholder value," and that that committee then "publicly report on its analysis to stockholders." You could see why allowing shareholders to hold a nonbinding vote on whether to ask the board to appoint a committee to consider some stuff would be ... annoying? at worst? ... so JPMorgan has asked to exclude the proposal from its proxy statement and avoid that annoyance. What a pointless system, no? The sort of shareholder democracy embodied in 14a-8 shareholder proposals like this is just a weird sideshow that mainly engages the attention of a handful of junior lawyers. The only stakes in JPMorgan&apos;s efforts to exclude this proxy proposal are that if they fail, and have to include the proposal, and if the shareholders then vote for it, and if JPMorgan then decides not to appoint a committee to consider a thing it&apos;s not going to do, then JPMorgan will be mildly embarrassed and potentially get yelled at by governance watchdogs like ISS. Of course companies sometimes do what shareholders want, even without those shareholders mounting proxy fights. If big shareholders, or even big governance watchdogs, make their feelings known - publicly or otherwise - then they have a chance of convincing management that it&apos;s in management&apos;s best interests to do what they want. Unhappy big shareholders lead to takeovers, proxy fights, lower stock prices, and other unpleasantness, though I guess when you&apos;re JPMorgan they mostly lead to uncomfortable investor meetings. In any case, though, influential shareholders rarely make their feelings known via 14a-8 shareholder proposals. That two-track system - one official system for little shareholders to make their voices heard forcibly ignored, one informal back-channel system for big institutions to influence policy at the firms they invest in - is ... um, sort of obviously sensible in its way? The AFL-CIO, according to its proposal, owns 2,820 shares of JPMorgan, worth about $130K, or around 0.0001% of JPMorgan. And its focus is ... maybe not entirely on enhancing shareholder value. Why should Jamie Dimon pay any attention? But it&apos;s a weird little metaphor for so much in the equity markets. "We need a level playing field for large and small investors alike," many people say, but no one actually thinks. And so it&apos;s very important that there&apos;s a way for small investors to influence corporate policy that is elaborately worked out, carefully regulated, heavily lawyered, and totally meaningless. 1.I&apos;ve distinguished two senses of the word "activist" there; there are activist1 hedge funds (and the occasional long-only pension-y type) that take big positions in a stock and then meet with management, run proxy contests, etc., and sometimes actually make companies do stuff, and then there are activist2 union pensions, nuns, and assorted cranks, who submit proxy proposals and mostly irritate companies. 1. The Board of Directors should promptly appoint a committee (the "Stockholder Value Committee") composed exclusively of independent directors to explore extraordinary transactions that could enhance stockholder value, including but not limited to an extraordinary transaction resulting in the separation of one or more of JPMorgan&apos;s businesses. 2. The Stockholder Value Committee should publicly report on its analysis to stockholders no later than 120 days after the 2013 Annual Meeting of Stockholders. 3. In carrying out its evaluation, the Stockholder Value Committee should avail itself of such independent legal, investment banking and other third party advisers as the Stockholder Value Committee determines is necessary or appropriate in its sole discretion. An "extraordinary transaction" is a transaction for which stockholder approval is required under applicable law or stock exchange listing standards. 3.Incidentally some other countries don&apos;t let companies exclude proposals for that reason, which is how you get Nomura shareholders voting on toilet habits. 4.Though probably not because there are always other reasons to exclude proposals. JPM also thinks it can exclude this one for being packed with lies, about, like, how much committees cost or something, totally unclear to me. JPMorgan Shareholders Will Find Out If Jamie Dimon's Gonna Stay Chairman When Jamie Dimon Decides To Tell Them, Okay? Can we do Brexit again? Please?